This newest programming guide by bestselling author Jesse Liberty isn't your typical Visual Basic book. It's not a primer on the language, and it won't dull your brain with arguments hyping .NET either. Its goal, rather, is to make you immediately productive, creating Windows and Web applications using Visual Basic 2005 and Visual Studio 2005. Written for VB6 and novice programmers, the book shows how Visual Basic 2005 can be used to rapidly build modern Windows and web applications. What makes this book different is what's not included. 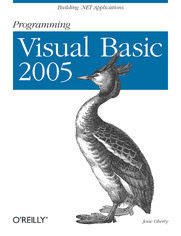 There's no introduction to Visual Basic, no explanation of how it fits into the .NET world. Why waste time reading about something you'll learn for yourself as soon as you start creating applications? You won't even write a "Hello World" program. With Programming Visual Basic 2005 you'll get started building something meaningful, right away. The book is divided into three parts--Building Windows Applications, Building Web Applications, and Programming with Visual Basic--each of which could be a book on its own. The author shares his thorough understanding of the subject matter through lucid explanations and intelligently designed lessons that guide you to increasing levels of expertise. By the time you've finished the book, you'll know how to program both Windows and web applications with VB 2005. The support for this book extends beyond its covers. Jesse offers a FAQ, Errata, complete source code and a link to a free private support discussion center on his web site: LibertyAssociates.com - just click on books. Jesse Liberty, Microsoft .NET MVP, is the best-selling author of O'Reilly Media's Programming ASP.NET and over a dozen other books on web and object-oriented programming. Jesse is a frequent contributor to many industry publications and websites, and has spoken at numerous industry events. He is a former Distinguished Software Engineer at AT&T and Vice President for technology development at CitiBank. Jesse Liberty's books have successfully guided thousands of programmers into the world of .NET programming, and Programming Visual Basic 2005 is no exception.